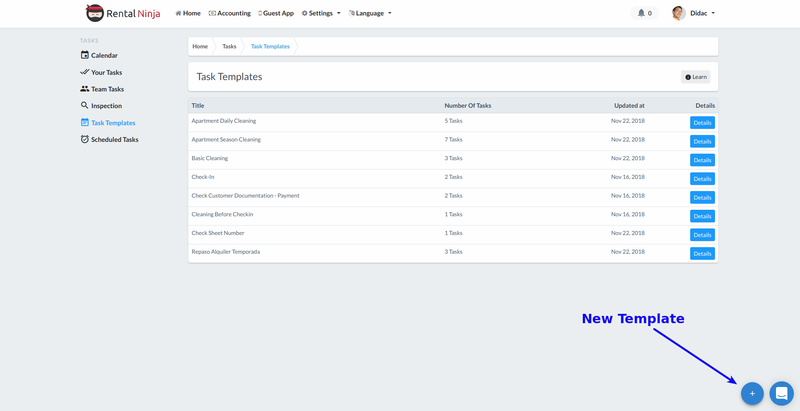 The intention of this guide is to help Rental Managers or any person in charge of the Task Management, on setting up the Rental Ninja Tasks Module. If you are a check-in agent, a member of the cleaning staff or any person that needs to complete a job, refer to the Tasks Module Section of the Mobile App Manual or to this article to complete jobs from the website. Only users with one of the following roles will be able to see the views that are described in this section: Team Owners, Admins & Rental Managers. The first thing you need to do is creating your Job Templates. Those templates are the task lists that will be completed by your team. Create one by clicking on the "+" icon. Give it a name and a description. Then you can add as much items as you want. The task items will act as list inputs of things that are required to be done to complete the Job. For any task item, you can require a picture to let the user complete it. So, unless there is at least one picture uploaded, the task item (therefore the entire Job) will not be able to be marked as completed. The picture request might be useful to make sure that the job is completed as desired by the Rental Managers. However, do not abuse from it as the assignee will need some time to make the pictures and upload them. Once you have created at least one Job Template, you are able to create Scheduled Jobs. The Scheduled Jobs create Jobs according to your bookings and their settings. Those Jobs will be related to the bookings. This means that if a booking is modified, his Jobs will be modified accordingly. For instance, imagine that you have 2 bookings on the same rental separated by 2 days. You have created a cleaning job based on the check-out: the job will start on the check-out time and finish on the check-in of the next booking or last a maximum of 48h. If the check-in day of the second booking is moved to the check-out date of the previous, the cleaning job will be modified accordingly despite that it belongs to the booking that was not modified. In this case, the job will be shortened between the check-out and the check-in. Whenever a booking is cancelled, his related jobs will also be deleted if you allow so on the Scheduled Job settings. The team members will be notified depending on their role and their relation with the job for jobs created, dates modified, job assigned, completed, inspected, rejected or uncompleted. To create a Scheduled Jobs, just click on the "+" button. As you see, the start and end dates of the jobs are relative to the bookings. For more information about those times, just refer to the explanation showed on the website. When choosing the job assignee, the website only shows the list of people to whom you can assign the job until you choose the applicable Rentals. This is because you will only see people in that list that has access to all the rentals you selected. So jobs will only be assigned to people that has access to the rental. A nice option here is to assign the jobs to "a role". This means that people with that role and access to the rental will be able to see the job and claim it for completion. You will also be able to assign jobs manually once created by the Scheduled Jobs instead of people claiming it. This is something that can be done from the Calendar. If you would like someone to be supervising the jobs, you can set an "Inspector". This person will be in charge of Approving or Rejecting the job once the Assignee has completed. If the Inspector rejects the job, it will be marked as uncompleted and will be back to the current jobs list. The system will look for new jobs to create or modify every 5 minutes. However, for newly created bookings or modifications, the jobs of that booking are created/modified instantly. The system will only create jobs 15 days in advance. If a Booking is cancelled, the jobs related to it, will also be removed if it's option is enabled. If a Booking changes its dates, the job will move with the booking. No need to manually change anything. If a job is assigned to a Role all the members of that role and with access to the Rentals of the Scheduled Job will be able to claim the job. Any person on that role but no access to the rental will not see the job. If a new booking arrives, jobs related to it will be immediately created. Now you know how to setup the Tasks Module. If you would like to know how to use it in a daily basis, creating manual jobs, completing them, assignation to a user, etc, read this article. Check also the mobile App articles to see how all the jobs that you created are seen by the staff in their mobile phone.